DETROIT (AP) John Wall felt the third quarter wasn’t much different from the first two. The Washington Wizards just made more of their open shots. Wall and the Wizards scored 45 points in the third, and although most of their 20-point lead slipped away in the fourth, they were able to hold on for a 122-112 victory over the Detroit Pistons on Friday night. Bradley Beal and Kelly Oubre Jr. had 26 points each, and Wall added 16 points and 11 assists. Washington shot 16 of 20 from the field and 6 of 8 from 3-point range in the third. 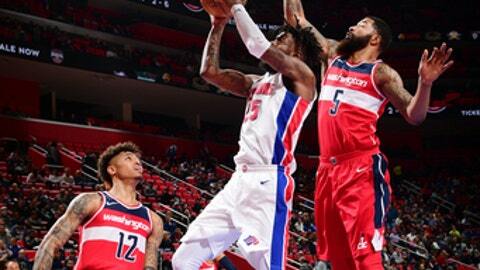 The Pistons trailed 83-63 in the third, but the deficit was down to four in the fourth when Wall made a big 3-pointer to put the Wizards up 107-100. Oubre added a four-point play a short while later to push Washington’s lead to nine. Andre Drummond had 14 points, 21 rebounds and eight assists for the Pistons, who have lost four straight. Both teams were struggling coming into the game. The Wizards lost by 24 at Charlotte on Wednesday, and they fell behind by 15 in the first quarter at Detroit. It was tied at 46 at halftime, though. Washington dominated the third. Beal scored 13 points in the period and Wall, who was scoreless in the first half, added 10. The Wizards led 91-74 after three before Detroit rallied, with substitutes Stanley Johnson, Luke Kennard and Anthony Tolliver helping lead the comeback. Wizards: Beal scored at least 20 points for the 35th time this season. No guard in the Eastern Conference has done it more often. … Oubre set a career high in scoring. His previous mark was 22 points earlier this season. Pistons: Drummond had 14 rebounds in the first half and played almost the entire second before fouling out. Detroit forward Jon Leuer told the Detroit News earlier Friday that he had decided to have season-ending ankle surgery. The 6-foot-10 Leuer has played in only eight games this season. The 76-point second half was the highest-scoring half of the season for the Wizards. They had 73 in the second at Philadelphia on Nov. 29. Wizards: Visit the Dallas Mavericks on Monday night. Pistons: Host the Brooklyn Nets on Sunday.